I'll post another pic once it's framed! I've already posted these drawings on Instagram, Pinterest and Facebook, but why have I neglected my blog?! 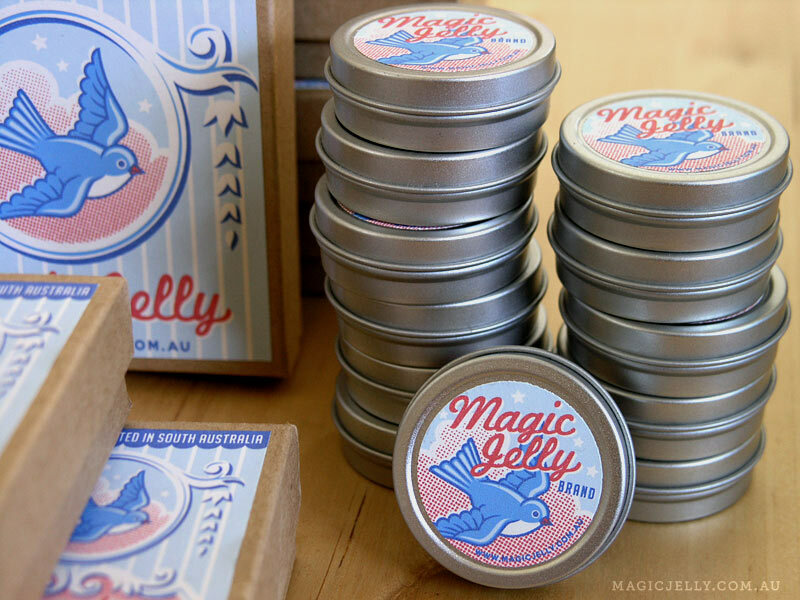 Reading this article provides yet another wake up call about which baskets to put your eggs in, and makes me feel renewed appreciation for my own little corner of the internet here on magicjelly.com.au, as well as eternal gratitude to the people who still read my blog and newsletter. I think one of the reasons I don't post on my blog as often as I should is because I always want everything to be perfect, which takes time, where as posting on Facebook or Instagram is just so quick and easy. But I think it's important that new content is posted here first, as well as posting content that isn't featured elsewhere. Happily, I finally sorted out my blog feed woes too, so now, whether you subscribe in a reader or by email, all of my graphics appear (in living technicolour!). Hooray! So anyway, here are two of my drawings you might not have seen before. The pink lady is called Gracie (once my new shop is open, she'll be for sale, along with other mixed media drawings in a similar vein, and assorted new drawings, collages and gocco prints). I just love drawing on tinted papers using white charcoal for highlights. The other is a drawing called Violet. I thought I'd show you a close up detail too. Some people like to shade using the edge of the pencil, and blend by rubbing, and achieve some lovely effects too, especially on textured papers. I prefer to draw on relatively smooth papers and just use the point of a sharpened pencil, which is basically a build up of tiny lines creating a blended effect. That way you get a fairly fine looking drawing. It means I tend to stay down the hard end of the pencil spectrum, favouring 2b-2h, with only touches of the softer, darker pencils like 6b. Drawing like this is very time-consuming, but it suits the way I like to work, which is quite finicky and fuss-budgety. I've pretty much finished my new site, which includes a new shop and gallery, but have a few little technical issues to work out. I'm lucky to have my old friend Julian working on it for me (who built my blog for me), so it shouldn't be too long before everything's up and running. Next I'd like to spruce up my blog a little - perhaps a new header? Where ever your interests lie; whether you like to cook, sew, build models, or take photos, or tumble rocks (or climb them! ), don't you find that looking at all of your equipment and supplies just makes you so happy? 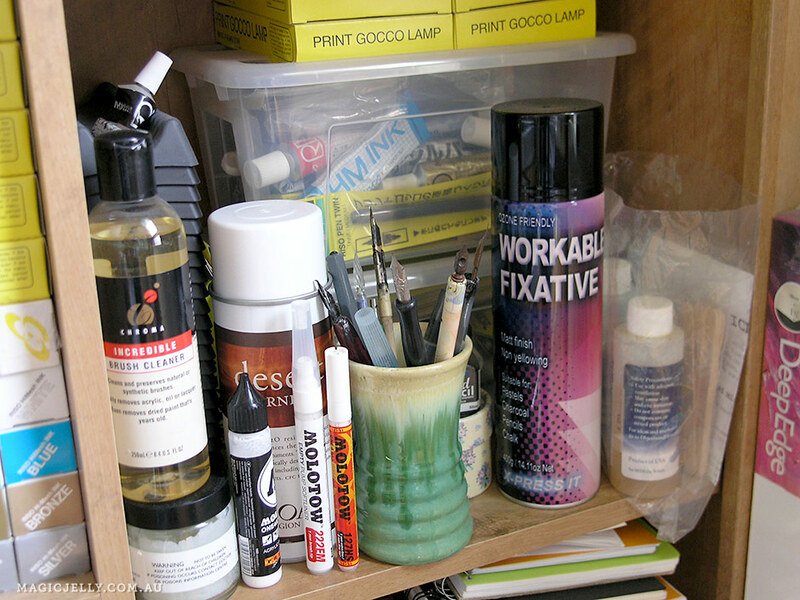 I admit it, I am a total art supply hoarder. I love looking at other people's stuff, so I thought I'd show you some of mine! 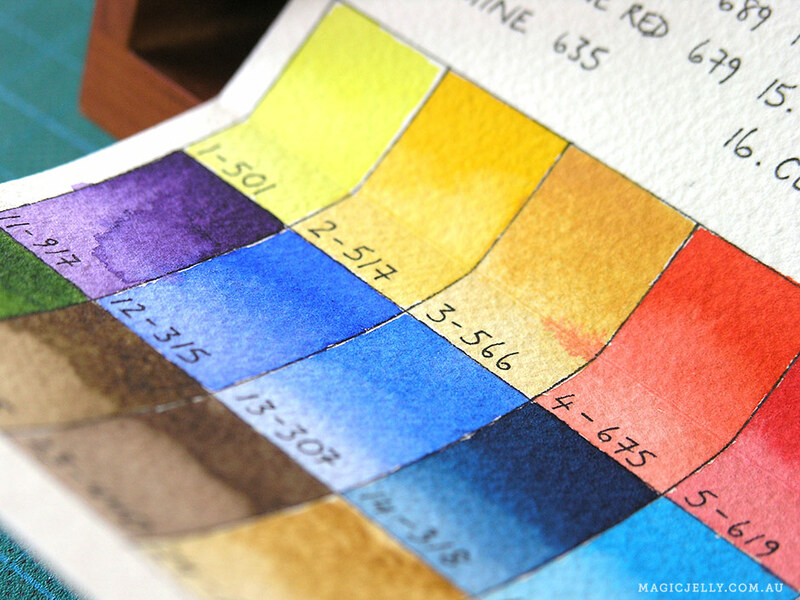 I made a colour chart for my watercolours. Some of my brushes. I only have synthetic ones because I don't want to use animal hair. My latest purchase is a Winsor & Newton "Cotman" round brush for watercolours (highly recommended if you're looking for a decent quality synthetic brush). A plethora of pencils! Clockwise from top left: set of 12 Stabilo pastel pencils, set of 12 Conté a Paris graphite and carbon pencils (which I didn't use until recently because they didn't fit into any of my pencil sharpeners! ), set of 24 Staedtler "Aquarell" pencils (I also have a set of 42 Derwent watercolour pencils), set of 24 Winsor & Newton soft pastels (that I've barely used - not my favourite medium), set of 12 Derwent "Inktense" watercolour pencils, set of 12 Bruynzeel-Sakura "Design" graphite drawing pencils. This tin of 72 Derwent colour pencils is very dear to me because I've owned it since I was a young'un (the eighties!). I actually typed out a colour chart - on a typewriter! Side note: my grandma once told me that when she was in primary school they used a tray of wet sand and a stick to learn how to write the alphabet (almost as good as an iPad)! I only bought these Bruynzeel-Sakura "Design" graphite pencils earlier this year, but they are my favourite drawing pencils ever. They range from 2H to 9B - previously I'd only used up to 6B, I didn't even know they made 9Bs! They're nice and smooth (not scratchy) and dense. I have two sets, one that I keep with nice sharp points for detail, and one with rounded points for shading. This works out to be quite economical in the long run because you're not constantly sharpening pencils you've blunted from shading. One thing I forgot to take a photo of is my tin of General's Charcoal White pencils, which I absolutely love. They're not too soft or crumbly, incredibly smooth, never scratchy, and have much denser pigment than even the softest colour pencil I've tried. I love drawing on coloured paper with them. There was one problem...they were impossible to sharpen. I was driven to distraction trying to maintain a fine point, because no matter what I tried, they would always break. Then the lady at the art shop recommended the (rather unfortunately named) KUM Automatic Long Point sharpener, which is the best ten dollars I've ever spent - not a single breakage since! This is the bees knees of pencil sharpeners, and I'm a total convert to the long point. It sharpens the wood first, then the point, and works out to be quite economical because sometimes when your pencil starts to get a bit blunt you can get away with just sharpening the lead, so your pencils last longer! The only little downside...it doesn't sharpen pastel pencils, you'll still need a special sharpener for those. You might already know how great erasers are when it comes to drawing and blending, not just for erasing mistakes. I used to use kneadable erasers for fine details, but I've always found them a bit messy, so here's a little tip of mine... I slice off little pieces of eraser with a sharp knife and mitre the ends to a fine point, and they're incredibly precise for those little details. When the eraser gets blunt and/or grubby you just cut it to a pointy edge again. My favourite eraser (again, another recommendation from the art shop lady) is a Moo Professional Eraser. The art shop lady (maybe I'll refer to her as "ASL" from now on) described it as a cross between a kneadable and a regular vinyl eraser, and that pretty much explains it. They come in a big block, are quite soft (perhaps a little too crumbly), and work with graphite, colour pencils, charcoal and pastels. Rather than all those little messy bits that you normally have to brush from your drawings, this eraser just kind of gathers into one bit so your artwork is easier to clean up. Because of its softness you don't get any shine or damage to the surface of your paper and it does a really effective job of erasing. These Molotow markers are amazing! I bought two; a 1mm fine tip, and a 1mm brush tip "Softliner", along with a couple of spares (the tips are replaceable) and some refill paint. I was only interested in white because I wanted to use them to add details to monochrome ink drawings, but they come in a range of colours. 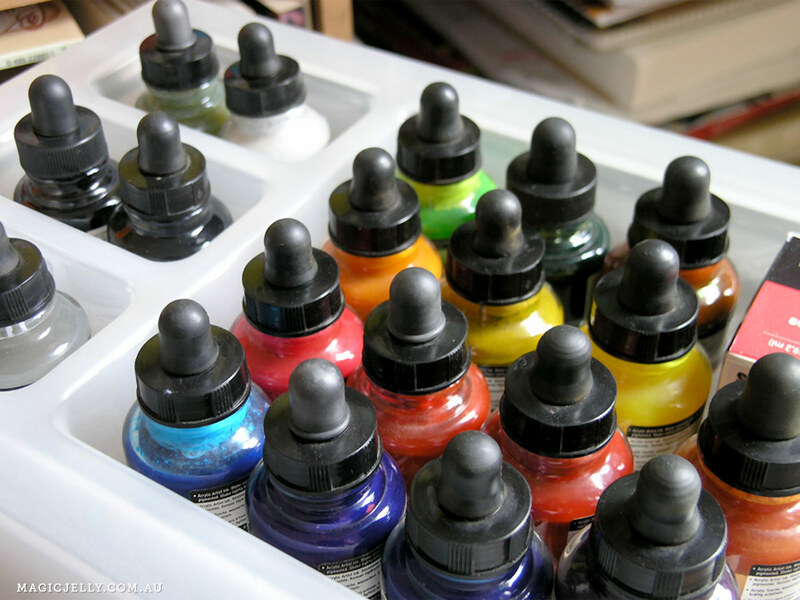 What's so great about Molotow markers is that instead of ink, they hold acrylic paint that although quite thin, has incredibly dense pigment - the white is truly opaque. They have a pump action (but beware of over doing it and causing the paint to flood) and absolutely amazing flow. They're refillable, and you can mix and/or dilute the colours. A couple of downsides... The paint takes a little while to dry (especially on non-porous surfaces) so you do need to be careful not to smudge your work, and you also have to be careful the tips don't dry out and become clogged. Some people recommend soaking blocked tips in acetone, but I just rinse them in water after each use and let them dry thoroughly (this takes a few days, so if you plan to use them again in the immediate future, best to leave the tips in but make sure the caps are properly sealed). They write on a huge range of surfaces, and all in all are very versatile and totally nifty. Whatever will they think of next?! I tried Derivan "Liquid Pencil" and found it lumpy and difficult to blend. Disappointing, because the idea of watercolour graphite is really appealing. 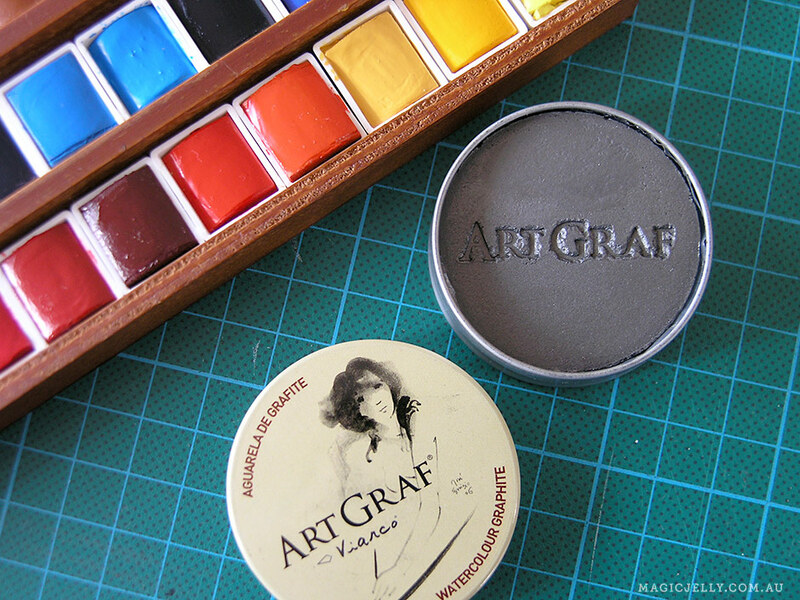 Then I discovered Viarco "Art Graf" water soluble graphite. It's very smooth and blendable and nice to use. One small criticism...I haven't been able to achieve a really dense dark grey-black, but it's great for washes and easy to build up lovely tones. So there you are; a little wrap up of some of my art stuff. I hope some of you fellow art supply hoarders found it interesting! I read this interesting article on Digital Arts yesterday: 10 Colour Secrets from Leading Illustrators. It's great getting some insight into how other illustrators work with colour. I might not be a "leading illustrator" myself, but I thought I'd share my own thoughts on choosing colours - maybe you'll find it helpful! A limited palette I pretty much always work with a limited colour palette - anywhere from one to six colours. That Photoshop colour picker, loaded with squillions of options (or that huge tin of pencils, plethora of ink bottles, etc) is very tempting, but too much choice can be a pitfall. I think that limiting your palette helps with the logic, rhythm and flow, so the important elements stand out and the secondary elements recede and work to create depth and texture (or whatever they're there to do!). Limiting your colours also calls on your ingenuity to create something that's still dynamic or rich with detail and variation. 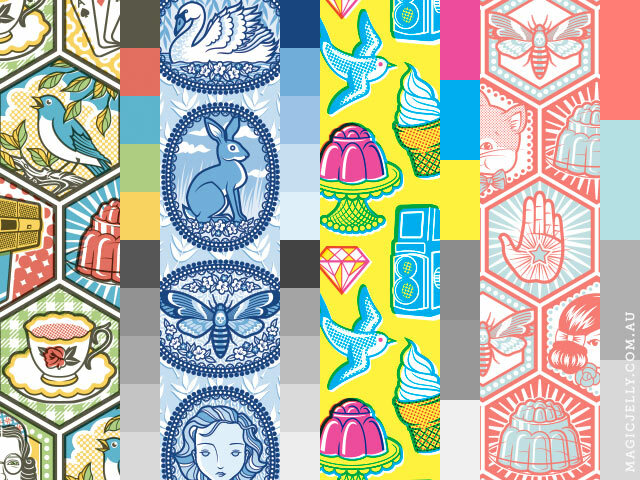 I like to use halftones, pattern and negative space, rather than introduce more colour. I also love the charm of vintage illustrations where a limited palette was a practicality. I remember in some of my favourite picture books when I was little, you'd have the lovely glossy full-colour pages alternating with the pulpy, uncoated pages featuring one or two colour illustrations. I think I used to prefer those to the shiny colourfest! I think there's something really intriguing about what an artist does with line and tone when a full colour palette isn't an option. Nothing's black and white Black isn't always black. I very rarely use pure black, preferring softer blacks, such as a desaturated dark blue, a warm brown-black from a yellow palette, or a dull, dark red. For something more subtle and muted, I also like to use less intense colours in place of black. As long as there's enough contrast, it can still work. White might mean 0% ink, but it's still a useful addition to your palette - especially if you're only working with one or two other colours. There are some really amazing illustrations around that use negative space and let the colour and texture of the paper/background do the talking. Tonal values I usually try to work out my colour palette before I begin, but there are often changes as I go along. In trying to pick the right combo, I like to desaturate my palette and check the percentage of black for each colour. You can make lovely, muted illustrations using colours with a similar tonal value, but most times I prefer to have a range across the greyscale spectrum, to create enough contrast. I'm mindful of the saturation of each colour for the same reason. Anyway, that's my five cents' worth! Here are some proofs of a few of my new greeting card designs. I can't wait to have them all printed! They'll be in the shop soon, and if you're a retailer interested in stocking my cards, please email me! I hope you're all having a nice, relaxing Easter weekend. It's a windy ol' Good Friday 'round these parts; I pity anyone attempting a picnic! A quiet day at home for me. I've been working on my jewellery packaging (as you can see from the pics) & now I'm done with that for now, it's time to go & bake some cinnamon scrolls with pecans & cranberries (in lieu of hot cross buns - vegan ones are tricky to come by) & perhaps get in a little sofa time & watch some DVDs. I've been thinking of re-watching Atonement because I saw another Ian McEwan adaptation on the teev the other day, Enduring Love, which I really enjoyed. The beginning was so haunting, it's still stuck in my head! Has anyone seen it? I do love Atonement, but you've got to be in a buoyant mood because it's so terribly sad! 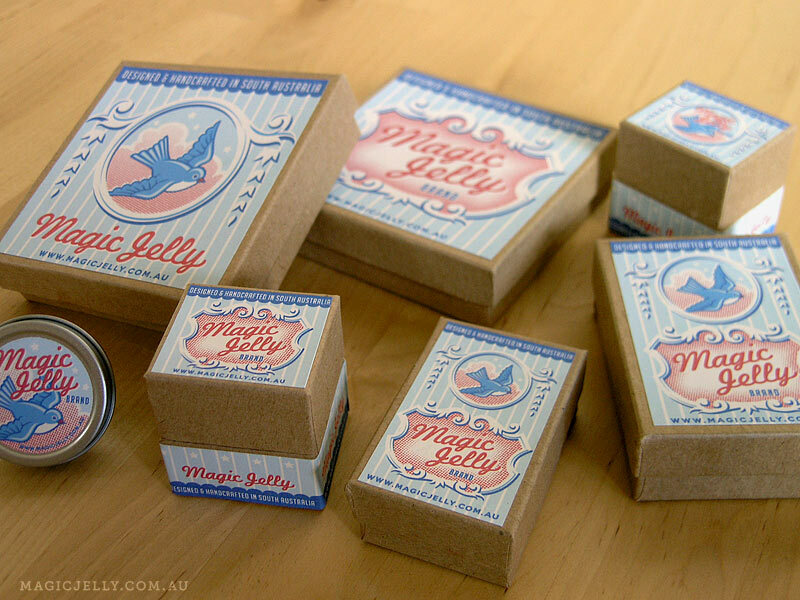 Anyway, here are some sneak peeks at my jewellery packaging. I'm rather happy with it! I've posted so many photos because none of them really do these enticing little boxes justice - there's something very tactile & pick-up-able about them. 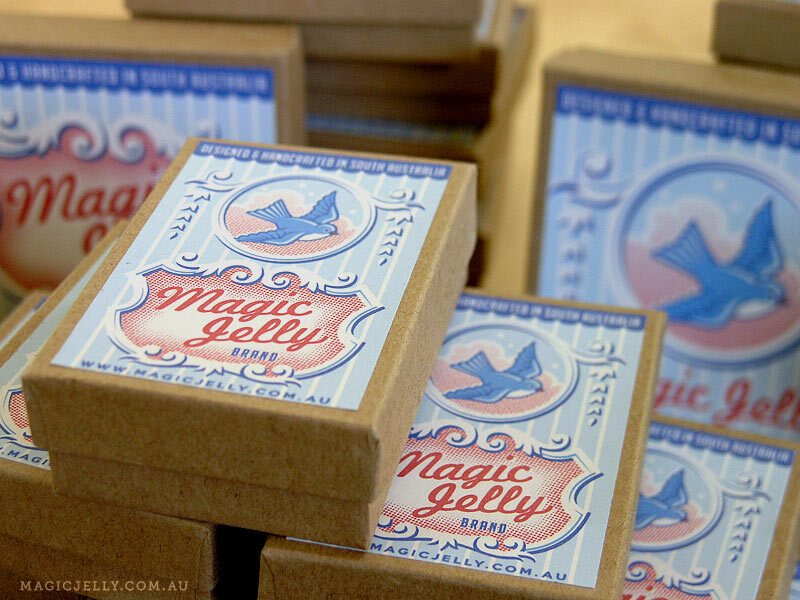 The designs are influenced a little by vintage matchboxes & mid-20th century Chinese apothecary labels, as well as 1930s-40s beauty products. The boxes have a genuinely vintage look, in part due to my paper choice, which is made to emulate old, faded butcher paper. It has a lovely sheen & feel. For once, I could make my designs unashamedly girly because the products are solely for we gals. Sorry chaps, I might do some tiepins & cufflinks in future! I thought I'd show you what I'm making today. Here are some pieces from a range of jewellery destined for my shop, waiting to be sealed within resin & made all shiny & gem-like. I've already shown you this bracelet from my folk art inspired range, these blue & white designs are influenced (as you might have guessed!) by Delftware. I wanted to do a woodland theme, but not the usual suspects such as bears & rabbits. I finished the swan the other day (I'm quite happy with it!) & I'm currently drawing weasels for yet another addition to The Woodlanders range. You might have noticed the little weasel I drew for this calendar - I thought he was so cute I just knew another weasel would pop up soon enough. These pieces are quite large - 55x43mm (2.15x1.7 inches) - & I'm making them into pendants & cuff bracelets (the little hearts top-right are for matching rings). I like larger jewellery myself, but I'm also making some dainty-sized pieces too. I've had friends & family road testing my jewellery for about a year now, & it's great to see it stand up to the rigors of every day wear & tear such as grabby toddlers. Nicest of all is hearing reports back of the compliments my jewellery has received! 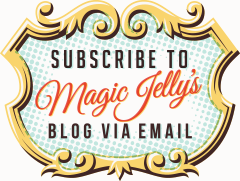 If you'd like to be notified when my shop is open & my jewellery is for sale, you might like to subscribe to my newsletter, which you can do to your right, via my sidebar sign up form, at the foot of the page, via my contact page, or by checking a little box when you comment on a post. Did you have a good Christmas? My aim was to have a relaxing, stress-free time, but it never quite happens that way does it? The last few days before Christmas were a flurry of making & baking. We decided to make each other presents this year - here are a few pics of the things I made. I wanted to make things I don't normally do & I used vintage graphics instead of my own artwork - I wanted to give everyone something they wouldn't be expecting from me. Despite the last minute rush, I really had a lot of fun making fudge, shortbreads, soy candles, compact mirrors, lip balms & potpourri sachets. It wasn't so much fun making chocolate truffles...they turned out a little lumpy & I somehow managed to get chocolate everywhere. I received some beautiful gifts in return. My sister Cass & her boyfriend Dave planted me a herb garden & made delicious walnut shortbreads, & my best friend Mark & his fiancé Stevie made gift boxes of bath & beauty products with the most gorgeous packaging. I hope you had a chance to catch up with the people you love & had a wonderful time! I'm looking forward to doing nothing for the rest of today...maybe some reading & DVD watching, & a sandwich made from leftover glazed seitan roast with cashew lemon & thyme stuffing. Yum!